Apologies for being a bit tardy in getting the second blog out, I’m not sure where November and the first half of December went, but they were gone in a flash. I was lucky enough to spend some of November in Cambodia, trekking . It is a beautiful country with some of the friendliest people I’ve ever encountered. The food is fabulous, similar to Thai but rather than salty, sweet, sour & sharp as it is in Thailand it is sharp & sweet. Coconut based Khmer curries are light and fragrant and the use of spices is subtle. The French were in Cambodia for a while and their presence is clear to see not only in the architecture, blue enamel street names, bistro chairs, excellent coffee and the use of French as a second language for many older Khmer people but croissants and baguettes are part of everyday life…delicious. Tropical fruit in the tropics just tastes sublime and eating the much smaller super sweet pineapples that grow in that part of the world that have been ripened by the sun, well it doesn’t get much better than that. So with Christmas looming but my mind still in the warmer climes of South East Asia, the recipe is another one we get asked for a lot. It is a lovely dessert. It is Oscar’s version of the Indian ice cream, kulfi. We have just replaced the condensed milk used in many parts of India with double cream. This is a fabulously easy and delicious recipe and a great treat to have in your freezer. Remember it does contain raw eggs so make sure they spankingly fresh. As it is the sum of just four parts and unlike many shop bought ice creams, it isn’t full of preservatives, don’t keep it for more than a month in your freezer. In our house it never gets the chance! 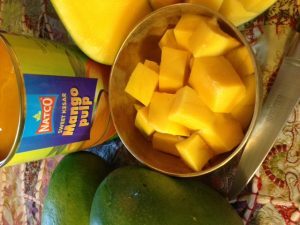 If you can’t find good ripe mangoes or don’t want the faff , you can use tinned mango. I use Kesar or Alphonso Mango Pulp that I buy from www.spicesofindia.co.uk . ( my go-to supplier of all things Indian food wise ) If you use either of these you might want to halve the amount of sugar, agave, honey you put it. The tins are quite large and so I put a layer of the puree in the tin first, giving you a sorbet layer on the top. If you want a perfect layer for presentation, pour some into the bottom of the tin and pop it into the freezer for a bit to freeze before making the kulfi & pouring it on the top of the sorbet layer. Coming back on Eurostar from a lovely day in Lille yesterday, I was sitting next to and behind a group of thirty somethings who were planning a big Christmas lunch and discussing who was doing what on the big day. It sounded like my idea of hell and was so unnecessarily complicated and convoluted it sounded like a recipe for a very stressful and possibly raw or undercooked / overcooked lunch. Why do people do it? ……so do yourselves a favour and buy the simple ingredients ( if you go on the Spices of India website , you’ll be on their for a while ! it’s fabulous….do take a look at the fresh produce section. ) and take a bit of stress out of your festive entertaining and have this little beauty in your freezer. NOTE : If you use tinned mango puree , I would only use Kesar or Alphonso by Natco from good Indian/ Asian grocery shops or www.spicesofindia.co.uk . I bought some from one of the supposedly better supermarkets , it was their own brand and was an unpalatable tasteless rather nasty coloured goo……. LIGHTLY OIL & LINE THE TIN WITH CLING FILM LEAVING ENOUGH TO HANG OVER THE SIDES. WHIZ MANGOES IN FOOD PROCESSOR, SET ASIDE. POUR INTO PREPARED TIN & COVER WITH CLINGFILM. FREEZE OVERNIGHT OR FOR UP TO ONE MONTH. THIS CAN BE MADE WITH GREEK YOGHURT BUT ISN’T SO CREAMY OR SWEET. 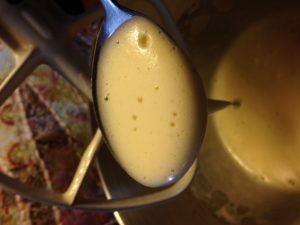 YOU CAN ALSO PUT SOME OF THE PUREE IN THE BOTTOM OF THE TIN FOR A LAYER OF SORBET ON THE TOP.